Glue stains on a carpet can be an eyesore for a homeowner and his or her family. While glue stains can be difficult to remove, there are a number of cleaning products that can be effective for removing glue. The following guide provides effective tips for removing glue stains from a carpet. It’s important to determine what type of glue has stained a carpet. Different types of glue will require different solvents for removal. Water-based glues are commonly used for children’s craft projects. For example, Elmer’s Glue is nontoxic, resists staining and is safe for use on a variety of surfaces. When removing water-based glue, it’s important to have a sponge and a bucket of warm water. If the glue is still wet, try to mop it up with a moist sponge. If the glue has already dried into a carpet, it may be necessary to soak the stain with warm water. Try placing a sponge soaked with warm water on top of the glue stain. After ten minutes, mop up the liquefied glue. Rubber cement glues are more difficult to remove than water-based glues. While water-based glues are designed for arts and crafts, rubber cement glue is often used for its strong adhesive qualities. It’s important to wear gloves when working with any rubber cement glue. In addition, it’s important to have proper ventilation. The fumes that are released by rubber cement glues can be hazardous to one’s health. Rubber cement can permanently damage a home’s carpet. While it’s possible to remove rubber cement using mineral spirits or rubbing alcohol, there will probably be discoloration after the glue is removed. It’s essential to cover a carpeted surface with newspapers, old towels or another protective layer. When removing rubber cement glues from a carpet, it may be necessary to use a powerful solvent. Rubber cement glue can be removed with clear nail polish remover, methanol, acetone, ethanol, mineral spirits and paint thinner. Before applying a solvent to a glue stain, it’s a good idea to test the solvent on a discrete section of a carpet. 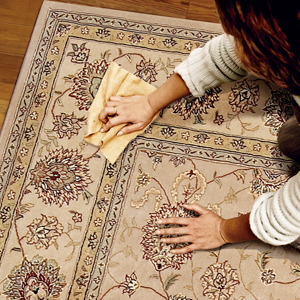 In many cases, a solvent will remove the natural dyes found in a carpet. If a solvent discolors a discrete corner of a carpet, it may be a good idea to try a different solvent. After applying a solvent to a glue stain, dab the area with a sponge immediately. It’s also important to have adequate ventilation in any area where one is working with solvents. After removing the glue stain, allow the solvent to evaporate. Most volatile solvents will evaporate in a few minutes. It may be necessary to recolor a carpet after it has been discolored by a solvent. Many retail stores and online shops sell “carpet pens” that can be used to recolor a damaged section of carpet. Permanent wood glues like Gorilla Glue cannot be removed from a carpet. A spill involving wood glue will require the replacement of a home’s carpet. For professional cleaning services, contact the team at High Quality Carpet Cleaning today.